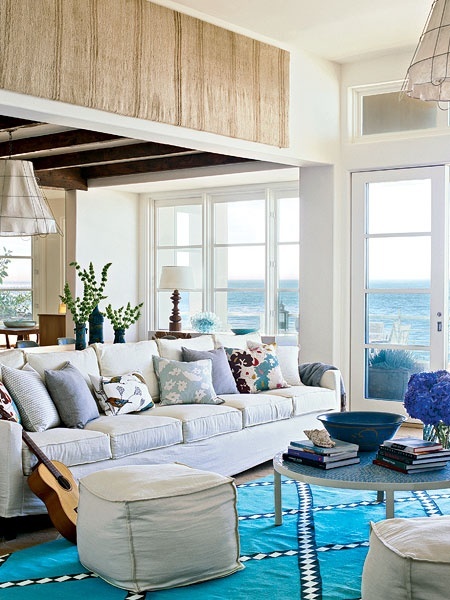 The use of blue and white hues in coastal home decor is something that will never go away. It’s a timeless color combination that we’ve blogged about and pinned on our Pinterest boards numerous Times. It’s just too good to ignore or stop gushing over. With spring starting to show it’s face again, these two hues start popping up more and more. There’s a pep with these two hues that bring your spirits high and a bring a sense of familiar ease. Check out what these designers have done with this classic color combination and think about using these wonderful hues in your home! Decorating your home with beautiful sea glass is a sure way to give your home the perfect coastal feel. You can’t go wrong with the coastal blues and greens that sea glass naturally has. The cool, coastal blues that are complimented by the greens set the perfect tone throughout any coastal home. You can utilize these colors in multiple ways with all the natural hues that you get from sea glass. You can use pastel blues and greens or even use bold ones. If you want to get extra wild you can always mix the two together. 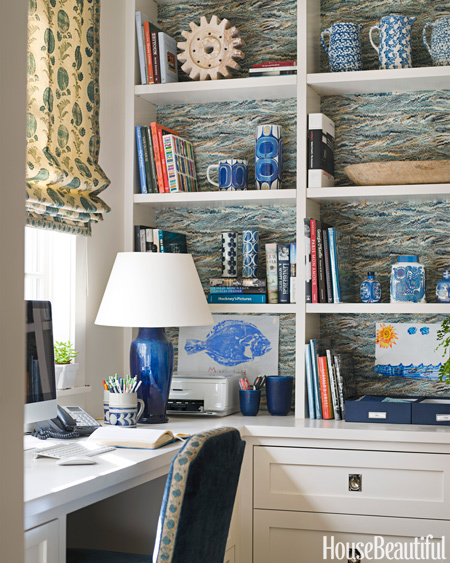 Check out what some of these designers have done and used sea glass colors in these spaces and get inspired by sea glass! There are plenty of ways to bring summer into your home. One fun way to show your summer love is to decorate with warm hues. They’re bright, colorful and they really shines! Like the our beloved summer sun. Warm hues bring an instant cheerful and happy feeling to any space. The hues promote light and warm in the space which make it feel more like summer. Imagine all those beautiful summer days and sunsets in your home! Check out some of the pictures in this post for a clear example, but there’s plenty of spaces out there that embrace warm hues. Most importantly, make sure you enjoy your summer inside and outside! Don’t forget your sunscreen! Indigo is a classic coastal home color. The rich, dark blue is the perfect compliment to the white palettes often used in coastal decor. It’s a bold and striking color that just feels so good to look at. The color is a versatile as well. 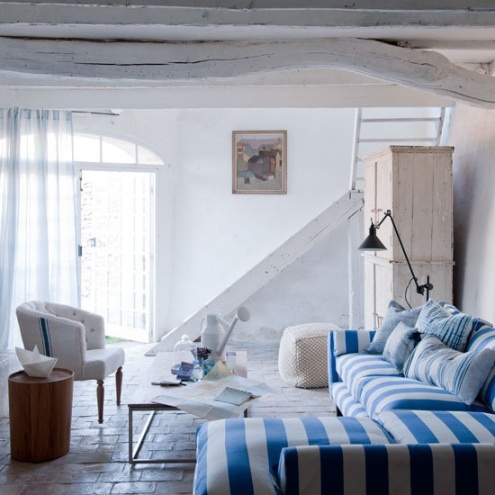 Often indigo dyed pillows and accessories are used in coastal design as well. These offer another treat to the eyes as they are interesting to look at and can show the range of indigo hues. The color can also be used a solid color without the dye effect. It still offers that rich color that fills a space with ease. This staple color in coastal design is a great hue to add to your home’s palette if you’re wanting a classic coastal look. Get inspired by these uses of indigo! From the wall art to the lovely dyed pillows, the design possibilities are endless and that what makes this color so interesting in coastal home decor. Spring is a time for colors! One color that is fun, bright and playful to design with is pink. 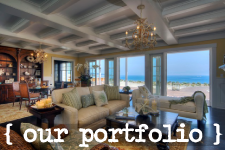 It’s a great color that can be used in any coastal home. It’s coastal by it’s very nature, literally. Think of all those glorious sunsets that have those beautiful oranges, yellows, pinks and purples. The pink hues in the sunset are the ones that stand out the most. Use pink hues to capture that same feeling in your home! Pink hues can go along way in little amounts. They can be used for fun pops of color and they can be used to lighten a space with a coat of paint on the walls. The fun part is deciding how you want to use pink in your decor. Get inspired by these designers and their use of pink. Figure out fun and exciting ways that you can bring the beautiful hue into your home! You’re invited over to a beautiful home and what’s the first thing you see? The Entryway. What’s more inviting than a splash of fun and bright colors? You don’t want to greet your guests or even come home to a boring entryway do you? Then take some notes and grab your paint brush because it’s time we cheer up the front of your home! A little paint on your front door can go a long way. We absolutely adore painted doors. I mean come on, we have a whole Pintrest board dedicated to them. Check it out Here! There are other ways, including painting your door, to bring some color and life back to your entryway. Like fun bright accessories or lively flowers showing off their petals. Even the pots you put your new flowers in can bring a punch of color! With so many fun possibilities between paint, flowers and accessories there’s no reason you can bring out the best in your entryway. People are naturally collectors. Sometimes it’s intentional and other times, well, life gets in the way and we forget to throw things away. When we decide on something to collector it seems like that’s all we want. We’re officially on the hunt! After a healthy amount of rummaging through flea markets, antique stores and garage sale, you finally amass a collection worthy of showing. How are you going to display the collection you worked so hard to find? We have a suggestion, head to the walls! Walls are a great way to display your collections! They give us plenty of space to show off our finds. Plus they provide extra room for you to add to your collection because let’s be honest, it never stops growing. Get fancy with the collection and frame it! 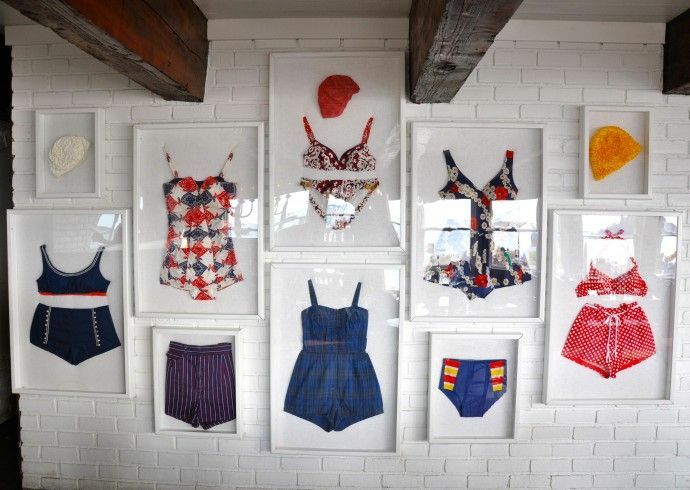 Frames are a great way to display the collection on the wall and let people know you’re proud of your hard work. Unfortunately, not all of our collections are framable, and that’s fine. Another way is to invest in wall shelves and prop your collection up for all to see. It lets you open up the space for other decor and design elements. Using the walls helps you make the most of the space in your home and prevents the over cluttering of side consoles or tables. So head to the walls and start displaying your collection today! Have you thought about bringing a little pouf into your life? More importantly, into your home? These floor pillows are the perfect accessory for any family room or living room. They add a fun design element and double as a little extra seating. Who wouldn’t mind that? They’re especially great for all those entertainers out there! In design, it’s the little things that count and a pouf can be used as a great accent in any space. They can add texture, color, or even act as a little extra filler in a large room. Tight on space or budget? No problem! These little guys are what you’re looking for! And when they’ve served their purpose or are no longer needed, you just pick up and move them out. Take a look at the poufs used these photos! They look great right?? 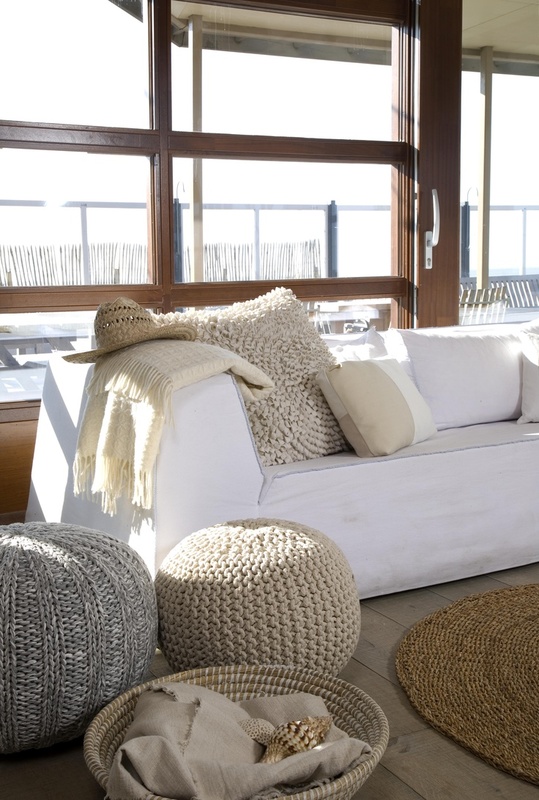 Start shopping for poufs now online at Tuvalu Home! Wallpaper’s not limited to the walls anymore. We love a good wallpaper and love it even more when it’s done right (as you’ll see below), but lately designers and creatives are pushing the potential for wallpaper. They’re using it creatively on the walls and putting in places that we should have been using it a long time ago, but for some reason we haven’t. Thanks to the internet – let’s be honest, Pinterest – people are sharing their creative ideas and uses of wallpaper which gets the wheels turning for everyone else. Finding new and exciting places to slap that wallpaper is pushing decor, design and style to another level and we love it. Check out some of these creative wallpaper ideas we’ve put in this post. Our favorite has to be the the picture right below this text. Look at the fireplace, that’s Ralph Lauren’s black Yacare Crocodile wallpaper on the chimney breast. We absolutely love that idea and placement. It definitely gets some ideas going in our heads. What do you guys think? Are you a fan? Also, what are some creative wallpaper ideas you’ve seen? Don’t behind afraid to drop us a line, we’d love to hear from you guys!